With technology increasingly transforming the way we work, companies need deep talent intelligence to stay competitive. This includes understanding how employees’ skill profiles stack up to market, where your skills gaps are, and how to close them. Since launching Coursera for Business two years ago and partnering with more than 1,400 companies, we’ve seen strong demand for talent measurement insights to power our customers’ learning, staffing, and hiring strategies. Today, we’re thrilled to launch Skills Benchmarking, a powerful new Coursera for Business tool that arms companies with the actionable data they need to develop a strategic workforce transformation agenda. 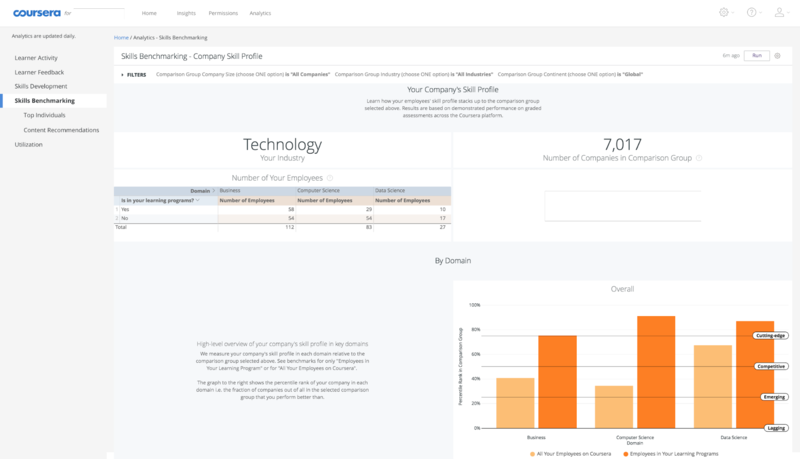 Skills Benchmarking dashboards are built atop our Skills Graph, which maps a robust hierarchy of skills to the content on the platform, as well as to the careers, companies, and industries that require them. Machine learning models trained on anonymized learning and assessment performance data from Coursera’s vast learner and content base provide a birds-eye view of your company’s talent benchmarks against a defined peer group. 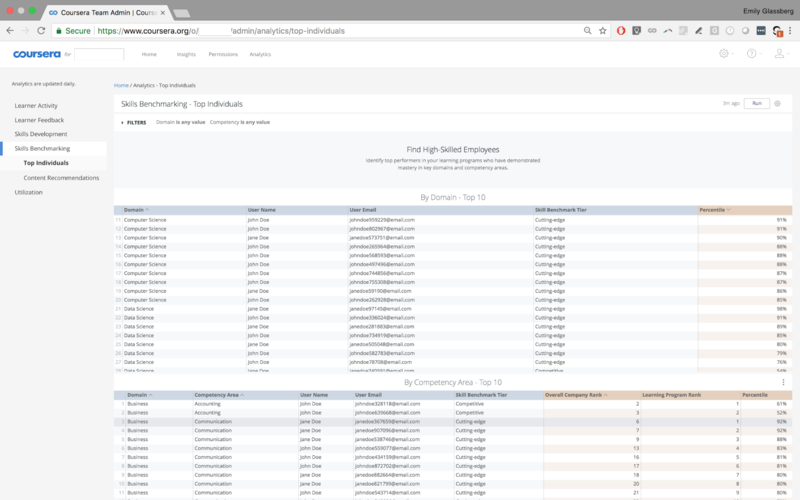 You can customize this peer group based on any combination of industry, geographic region, and company size. With this information, Coursera can help tailor a curriculum to your exact learning needs, cultivating strengths and shoring up weaknesses. 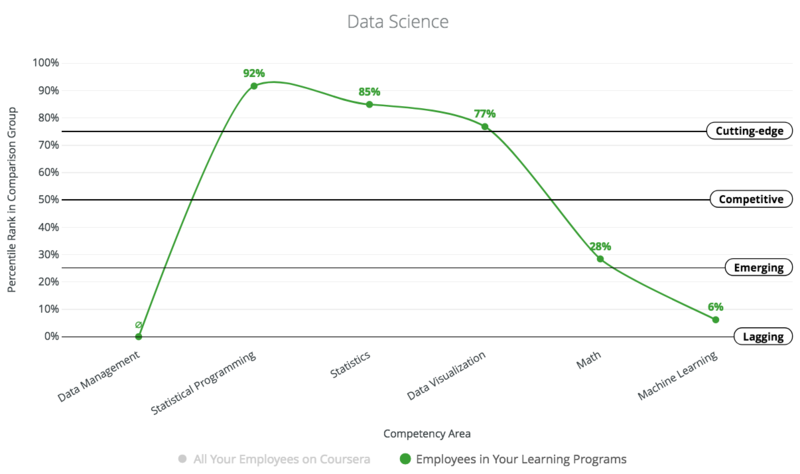 Skills Benchmarking also makes it easy to identify top individuals by broad competency areas like Data Science or by more granular skills like Statistics and Machine Learning, along with the individual’s percentile in each skill relative to all Coursera learners. Companies of all sizes and across industries are taking advantage of this new level of talent insight. Early customers, including Adobe and UNDP, are already using Skills Benchmarking to inform their L&D efforts; they have found it particularly helpful for understanding their competitive talent positioning, and for identifying employees with specific mission-critical skills. Consider the sample company shown below. Overall, they perform very well in each domain. Zooming in on Data Science, however, reveals specific strengths and areas for growth: while strong in the classical competencies like Statistics and Data Visualization, the company is weaker than its peers in Machine Learning. Since Machine Learning is a crucial application of Data Science today, this company changed its L&D strategy and is now doubling down on strengthening its employees skills in that area. This is just one example of how companies are already using Skills Benchmarking. The release arms a range of businesses, from brick-and-mortars undergoing digital transformation to software startups, with the numbers they need to understand and develop their talent. As tech advancement continues to force skills, jobs, and the people that hold them to change and advance, we’re advancing our own technology to facilitate those crucial transformations. Skills Benchmarking will become widely available to customers over the next few months. Want to learn more about how Skills Benchmarking can inform your L&D strategy? Reach out to us today.